On December 30, 2017, the Lord called home our beloved “Poppi”, Jimmie Wayne Burleson. At his side was his devoted wife of nearly 50 years, Rhonda Burleson, and his loving son and daughter, Troy and Melissa Burleson. Jimmie Wayne Burleson was born in Brenham, Texas on March 12, 1945 to William Burleson and Irene Lueckemeyer (Burleson). Jimmie leaves behind his wife Rhonda Burleson, his son and daughter Troy and Melissa Burleson, his grandsons Braden Burleson and Cohen Andrews, his granddaughter Tori Andrews, his brother Richard Burleson and his family, his sisters Lottie Tegeler, Gale Kossow and Sandra Carter and their families, his brother-in-law Chuck Barrington and his family and numerous nieces and nephews. His sister Mary Lou Thomas precedes Jimmie in death. In additions to his family, Jimmie leaves behind numerous friends who loved him. All who knew and loved Jimmie are heartbroken at his passing but are so very grateful for the 72 plus years that he brightened our lives and made us smile. Our Poppi loved the outdoors. 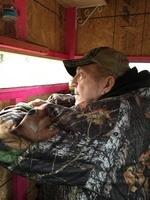 He loved fishing and hunting with family and friends. He was a hard worker who always provided for his family. Those who met Jimmie always left knowing a friend. Poppi was a master storyteller and always had a way of brightening your day with a joke or a smile. Jimmie was a good friend, a great father and a wonderful man. There is no love like that of a father’s. Nothing can repair the hole left in our hearts. But, we take comfort in knowing you are with the Heavenly Father. We love you, Poppi. And we will miss you dearly! Visitation for Jimmie Wayne Burleson will be held from 6:00 to 8:00 p.m. on Wednesday, January 3, 2018 at Beaty Funeral Home in Mineola, Texas. Services will be held at 3:00 p.m. on Thursday, January 4, 2018 at Freedom Baptist Church in Mineola, Texas. In lieu of flowers, the family requests donations to be made to Freedom Baptist Church in Mineola in honor of Jimmie Wayne Burleson. To send flowers to the family of Jimmie Wayne Burleson, please visit our Heartfelt Sympathies Store.